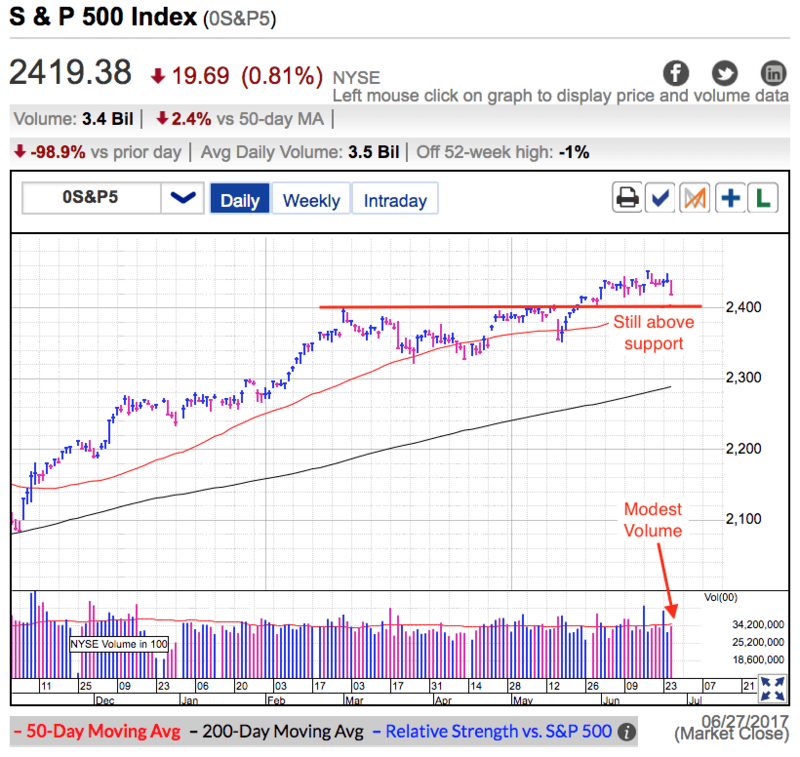 The S&P500 collapsed Tuesday in one of the worst selloffs in over a month. Of course “collapse” is a relative terms since today’s weakness didn’t even knock a full percentage point off of the S&P500. But given how benign the stock market has been recently, 0.8% is shocking enough to grab everyone’s attention. The tech heavy NASDAQ took a bigger hit, shedding 1.6%, but to put things in perspective, both indexes are still within a few points of all times highs. The headline that turned early weakness into a waterfall selloff was the GOP abandoning the planned health care vote because they didn’t have to votes to pass it. Health care is not that important to the market, but that the lack of unity on this issue puts the entire Republican agenda in jeopardy. The post-election stock market rally was built on expectations of tax cuts and today’s legislative logjam is not the narrative the market was hoping for. The question traders have to answer is if today’s weakness is the first hints of a much larger selloff. Or if this is simply another dip on our way higher. On the surface these headlines don’t seem any worse than the ones the market brushed off previously. Brexit? So what. Rate hike? Who cares. Special investigator looking into the president’s administration? No big deal. If the market didn’t care about those things, why should it care about this health care vote? In fact this isn’t even the first time a health care bill failed to pass. The House stumbled several times before they finally passed their version of Trumpcare. There is no reason to think the Senate won’t be able to do the same. Most likely today’s weakness will turn out to be a false alarm. Traders have been burned countless times every time they defensively sold weakness, only to see the market rebound even higher not long after they bailed out. It’s gotten to the point where so few people are selling headlines that dips barely last more than a few hours and go further than a handful of points. Right or wrong, headlines no longer matter if people stop selling them. Without supply, it is hard for any dip to build momentum. And that has been the story of this half-full market. No matter what the headlines have been, traders assumed everything will turn out fine and to this point that has been the right call. As a trader I love a little uncertainty and volatility. These create great trading opportunities because someone else’s fear becomes my payday. Unfortunately this has been a painfully boring market and I don’t think today’s headlines changes that. I fully believe this market is skating on thin ice, but this isn’t the headline that is going to take us under. The market will continue to give our politicians the benefit of doubt and Tuesday’s botched vote will be forgotten by Thursday. If we find support Wednesday, the selloff is done and we can go back to our summer naps. I wouldn’t be concerned until this market crashes through 2,400 support and keeps going. But even then I still think it is simply creating a larger buyable dip. Trends continue countless times, but they only reverse once. Fight this bull at your own risk.